Mix all the ingredients for the pakodas except the oil and add reqired water to make a thick batter. Heat oil in a kadai and drop spoonful of the batter into the hot oil. Deep fry till the pakodas are crisp and golden brown. Drain on absorbent paper. Keep aside. Mix curd, besan, turmeric powder, salt, green chilly paste, ginger paste, garlic paste and water till smooth and free of lumps. Heat oil in kadai, add cumin seeds, dry red chilly, curry leaves, hing, curd and besan mixture. Bring to a boil for 3 to 5 minutes. 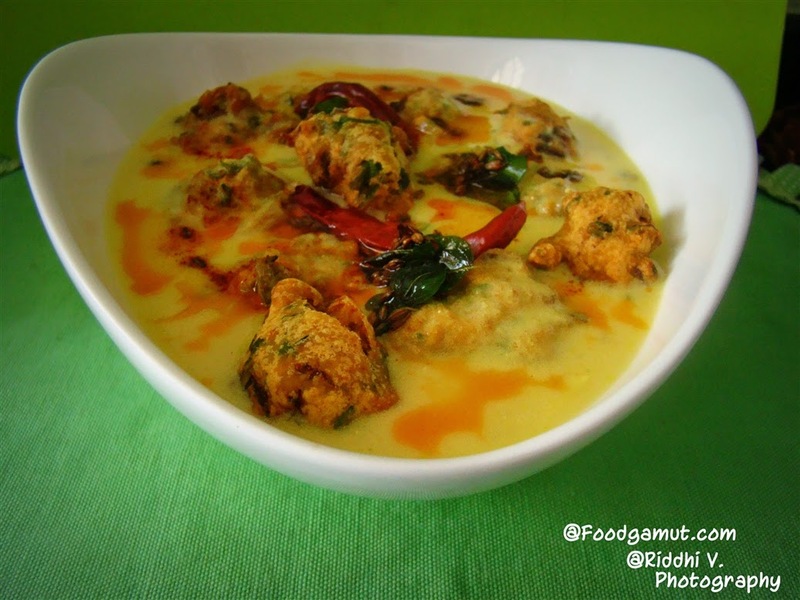 Drop the pakodas into the simmering kadhi and cook for 1 to 2 minutes.